What does 2x military-grade protection mean? MightyShell and MightyShell Clear exceed over two times MIL-STD-810G drop test standards. This means that an iPhone 6, iPhone 5s, and iPhone 5 were dropped at multiple heights and varying angles, and each time the iPhone retained full functionality without any damage to screen or buttons. What makes MightyShell so much more protective than competitor’s cases? Exactly how much does MightyShell add to iPhone 6 and iPhone 5/5s? MightyShell features a patent-pending design of three layers of protection around the perimeter bumper, made up of a hard outer shell to disperse impact, a rubbery interior to absorb shock, and a textured outer band to provide grip and added drop protection. Unlike other protective cases, the three-layer perimeter bumper of MightyShell only adds 3.5mm (.14″) width to the iPhone (compared to 2.5mm (.10″) width added to the perimeter of CandyShell). 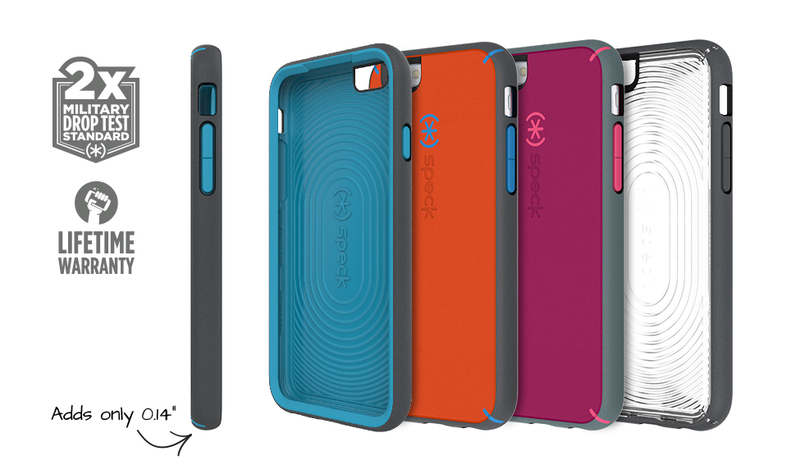 The added thickness to the back of the case, 2.5mm (.10″), is the same as our iconic CandyShell. How is MightyShell Clear different from MightyShell? MightyShell Clear features the same three layers as MightyShell, only the inner layers are clear to give the case a see-through look. Both clear layers feature a UV stabilizer to prevent yellowing, so you can admire the beautiful design of your iPhone while packing it with bulk-free military-grade protection. What is Radial Impact Geometry? Radial Impact Geometry is a new technology we’ve incorporated into the sides and back of our cases. The rings allow energy to disperse when your iPhone makes an impact on a hard surface (like during a fall), and the newly insulated walls of the case compress to absorb the shock from hitting a hard surface. What are the three layers of MightyShell made of? MightyShell is made up of a hard polycarbonate (PC) outer shell to disperse impact, a thermoplastic elastomer (TPE) interior to absorb shock, and a thermoplastic urethane (TPU) outer band to provide grip and added drop protection. We have added TPE covers to shield the volume and power buttons of your iPhone for added protection. Exactly what are the weight and dimensions of MightyShell? How does MightyShell interact with the new curved glass on iPhone 6? The three-layered perimeter bumper of MightyShell hugs the border of the new iPhone’s ion-strengthened glass, giving you extra screen safety around its curved edges. How does MightyShell interact with the newly raised camera lens on iPhone 6? MightyShell will not impede the camera functionality of iPhone 6 at all. In fact, we’ve added a special finish surrounding the camera that reduces glare when you use your camera’s flash. The back of the case keeps the iPhone’s newly raised camera lens from making contact with surfaces for extra protection. What other kinds of testing did MightyShell undergo? Is it patented? In addition to passing over two times MIL-STD-810G drop test standards, MightyShell and MightyShell Clear also passed accelerated life testing lasting 72 hours. This includes a thermal shock, humidity, and temperature test, as well as abrasion testing of all materials and components, as well as chemical resistance. MightyShell and MightyShell Clear are protected by patents and patents pending in the United States and/or internationally, including 8,204,561 and PCT/IB2013/059347. Where can I buy MightyShell and MightyShell Clear? Both MightyShell and MightyShell Clear are available at Best Buy stores nationwide and on speckproducts.com. What does the Lifetime Warranty on MightyShell cover? You can read about our Lifetime Limited Warranty on our Warranty page here.